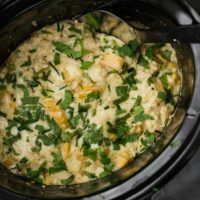 Slow Cooker Rutabaga Gratin with Millet | Naturally.Slow Cooker Rutabaga Gratin with Millet | Naturally. A perfect slow cooker dish, this rutabaga gratin can be started before all your guest arrive and be ready to serve when the rest of dinner is ready. In a small bowl, whisk together milk and mascarpone. Melt butter in Crock-Pot® slow cooker. Add rutabaga, millet, salt, pepper, thyme, and garlic powder. Pour in milk and mascarpone mixture along with the vegetable broth. Add 1/2 cup of shredded gruyere. Mix well and cover. Set Crock-Pot® slow cooker to cook on high for 4 hours or low to cook for 6 hours. With 30 minutes remaining, sprinkle remaining gruyere on top of gratin. Cover and let finish cooking. Serve with fresh chopped parsley and chives. Tips & Tricks: Be sure to chop the rutabaga into small cubes so they cook through. Larger pieces will result in still crunchy rutabaga when the millet has absorbed all the liquid.